Our unique rounded toe bow-topped shoe is the perfect finishing touch for Daisy Duck, Minnie Mouse and princess parties. Create unique favor boxes at home using our full-color digital templates. At this time, we only offer the sizes stated and we are not accepting custom requests for new sizes and shapes. 1. Choose 1 color for the shoe. 2. 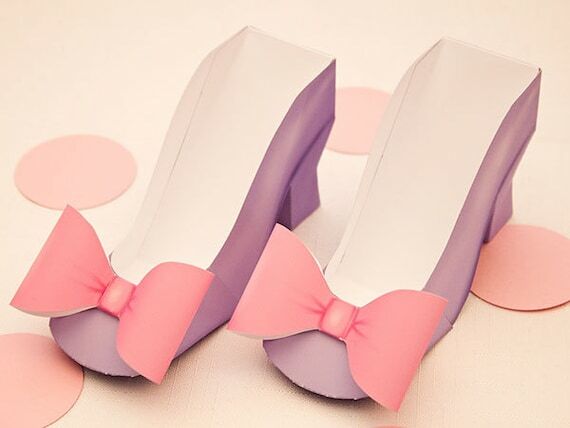 Choose 1 color for the bow. 5. Your order will be emailed to the email address on file with Etsy within 2 business days (Monday - Friday except holidays). No physical items will be shipped. 6. Download/save the file(s) upon receipt using a DESKTOP computer. Mobile devices will cause file issues. 1. Download/save the file(s) upon receipt using a DESKTOP computer. Mobile devices will cause file issues. 2. Open the latest version of Adobe Reader (free download from www.adobe.com). 3. Open the downloaded/saved file WITHIN Adobe Reader.